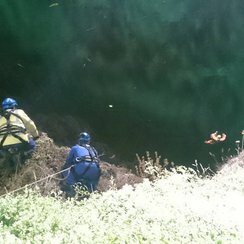 A man's died after spending six hours at the bottom of cliffs in Torquay. Police were investigating a concern for welfare report of a 55-year old man who was found down the cliff face at Daddyhole Plain. Torbay Coastguards were backed up by Teignmouth Coastguards joined police and the Search and Rescue helicopter from Newquay. The man was recovered on a spinal board and winched to the top of the cliff where he received medical treatment. Unfortunately the man was declared deceased a short while after. The man's next of kin has been informed and a file is being prepared for the coroner - his death is not being treated as suspicious.